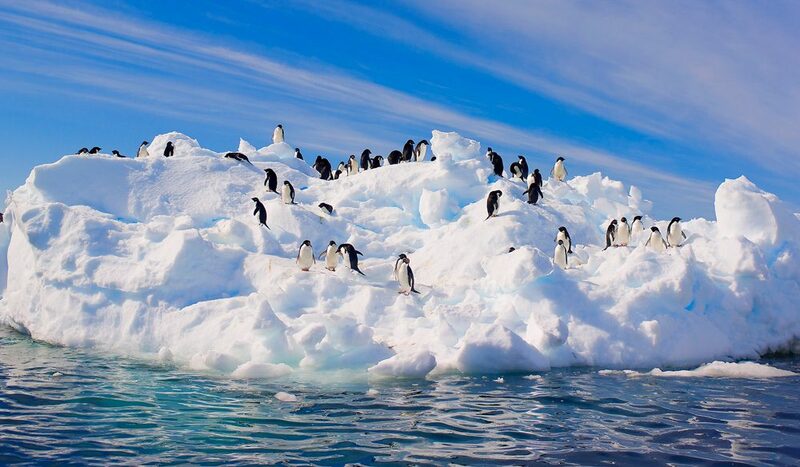 The Antarctic remains one of the world’s greatest wilderness areas and I’ve always wanted to experience its pristine beauty. It’s a place that still holds many mysteries and exciting tales of early explorers who’ve tried to unlock and explore its secrets. Its potentially hostile conditions keep we humans in check, respectful of something far greater than us. So when Orion asked me to join their expedition team to help people with their photography on an Antarctic adventure, I jumped at the chance. The Antarctic also has great significance to me personally, as it’s where one of my heroes, Frank Hurley (1885-1962), really made his name as an adventurer and photographer on his expeditions with early explorers like Mawson and Shackleton. Hurley’s voyage with Shackleton became one of the greatest survival stories of all time. The ship they sailed on became trapped in Antarctic pack ice, and was eventually crushed before sinking. So much for the ship’s name, Endurance. But the expedition team did endure against incredible odds. While most people would lose all hope in such a desperate situation, those intrepid adventurers simply dealt with it. Shackleton went on an epic journey by lifeboat to get help, while the others awaited rescue. They all knew the odds for survival weren’t good, yet while Hurley remained with the rest of the team for help, he continued shooting photos of the Endurance as it was slowly swallowed by the encroaching ice, taking with it their primary means of survival. What an amazing man, to be faced with the likelihood of death, yet keep documenting the event. Shackleton was ultimately able to raise help and Hurley and the rest of the team were saved. Hurley displayed great presence of mind to keep shooting through such an ordeal and those images have become some of his most famous. It just goes to show that out of great tribulation can sometimes come our greatest opportunities. It all depends on how we face our fears. 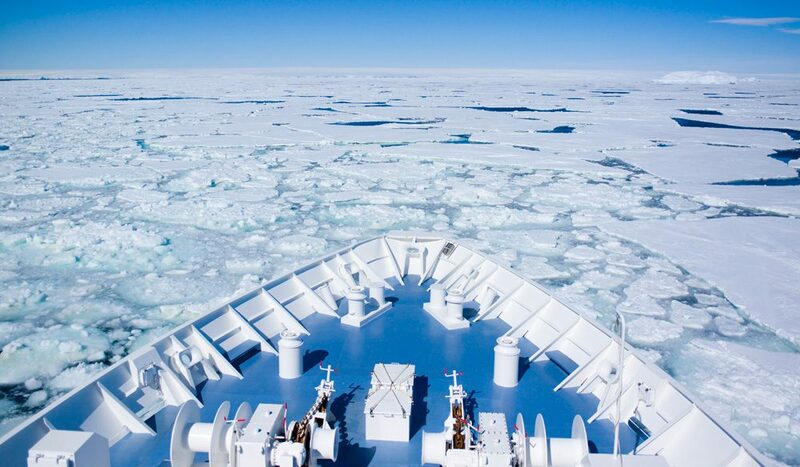 When I caught my first glimpse of the luxury cruise ship that was to be my Endurance for this Orion Antarctic Adventure, I was more than impressed. “Frankie baby,” I thought to myself, “eat your heart out.” This is surely the way to go adventuring. As we left the docks our leaders warned us we were now in expedition mode, so be ready for anything as inclement weather conditions can mess with even the best-laid plans. There was a lot of sea time between locations and I’d been warned the seas could get rough. They even had velcro straps on the beds for holding you in during big seas, which had me a little concerned. I was armed with seasick tablets and the works but in the end our whole trip was amazingly calm. 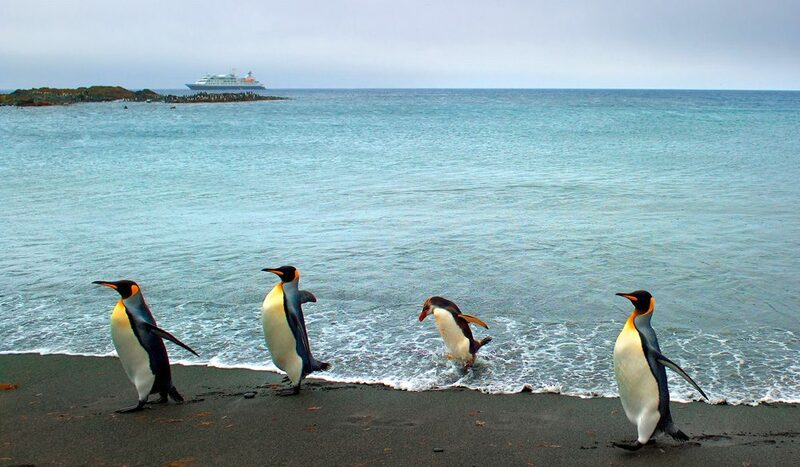 We stopped at some of the islands that form part of New Zealand’s sub Antarctic territories – the Snares and The Auckland islands were very interesting – but I was keen to get to the spots under Australian control, such as Macquarie Island and Commonwealth Bay on the Antarctic Continent. 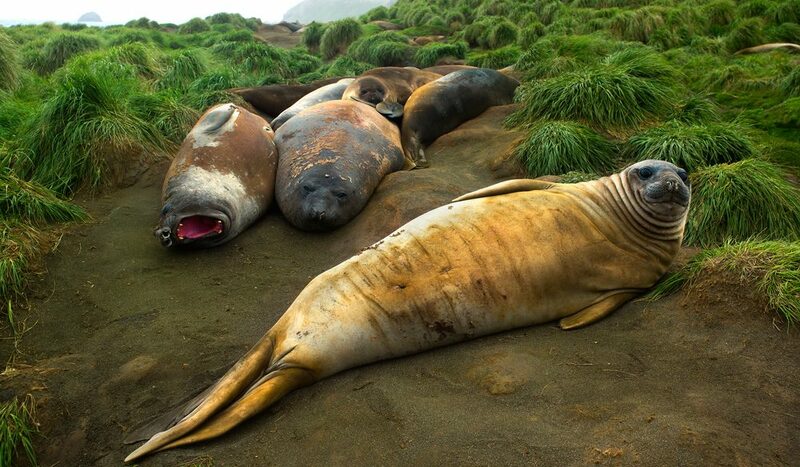 On the fourth day, Orion came to anchor at World Heritage-listed Macquarie Island. It’s a wildlife wonderland, with ruggedly dramatic windswept landscapes. 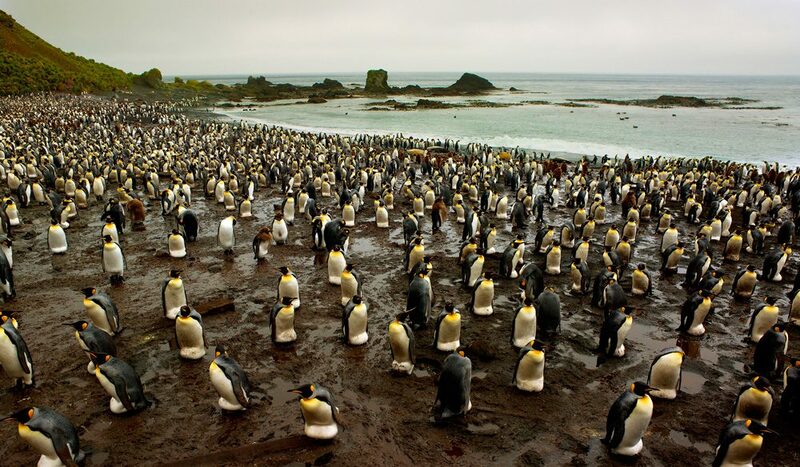 It’s difficult to convey in words the emotions that are evoked as you spend time with all the seals, birds and thousands of penguins promenading along the waterfront. There are rules as to how close human visitors can be to the local wildlife but inquisitive penguins, who are oblivious to the rules, come right up to you if you sit quietly. 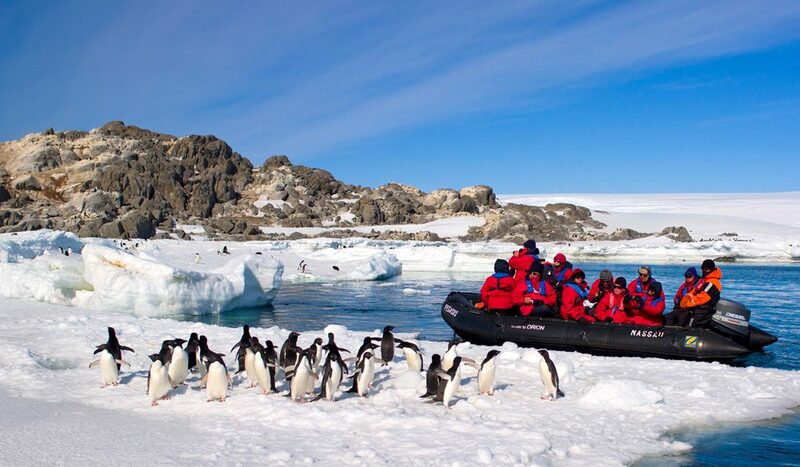 The first sight of mainland Antarctica was awe-inspiring and at Port Martin we visited a couple of locations by Zodiac, weaving around the ice and wildlife. 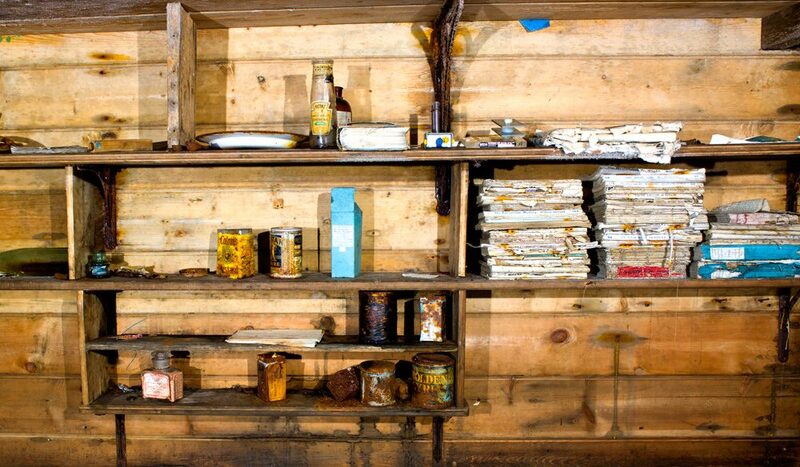 I went ashore with the first landing party and was allowed into Mawson’s Huts with painter and photographer Alasdair McGregor. Alasdair is a walking encyclopaedia on anything Antarctic. He knew all about my hero, Frank Hurley. To be in the hut that was home for so many adventurous people really helped me get a profound sense of how difficult it must have been for those early explorers. And to see Frank’s initials on his bunk and be in the darkroom in which he processed many of his classic prints was, for me, like being in a holy place. On the wall of the darkroom was a quote, probably written by Frank himself: “Near enough is not good enough”. We’d come a long way for this experience. No-one was disappointed. The howling winds began to rise once more, threatening to lock us in. It was time to leave. We headed back to the safety of our ship. 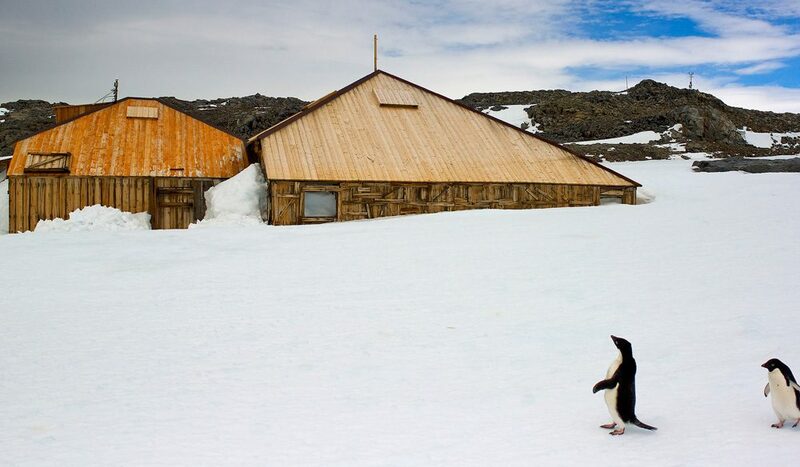 Travelling to the Antarctic continent is like entering a timeless sanctuary, one that gives us a portal through which we can look deeper into ourselves and the mysteries of nature. My visit gave me only a brief glimpse but already I feel a longing to return and explore more of this incredible region. 1. Make sure you take your camera gear out of an air-conditioned environment well before you want to use it, so you don’t have problems with condensation. 2. Carry a clean cotton t-shirt to clean your optics if you do get some condensation or need to clean rain spots off your lens or equipment. 3. Any time you’re on the ocean in boats, make sure you have a completely waterproof (storm) case or dry sack to protect your precious camera gear, as saltwater and cameras don’t mix. People can make the mistake of thinking a normal camera case is waterproof, but this is often not the case.